Ohio State and Michigan State are clearly the cream of the crop in the Big Ten this season, but both of these national powers have made life rough for bettors. The 5-0 Buckeyes are sporting a 1-4 record against the spread and the Spartans have yet to cover in any of their first five straight-up wins. These close calls are taking their toll in the national rankings and while Ohio State is still at the top of the list at No. 1, both TCU and Baylor have now leap-frogged No. 4 Michigan State in the latest AP Top 25. The Buckeyes will kick-off the Week 6 schedule in the Big Ten as 33.5-point home favorites against Maryland (2-3 SU and ATS) and BetOnline has set the total for this game at 54.5. Ohio State has failed to cover in five of its last six home games and the total has gone OVER in nine of their last 12 games played at home. Michigan State will be back in action as a 15-point road favorite against Rutgers. The Scarlet Knights are 2-2 SU (1-3 ATS) on the year with a 28-3 loss to Penn State as 8.5-point road underdogs in their Big Ten opener. The Spartans have been able to cover in four of their last five road games and the total has gone OVER in seven of their last eight games on the road. The Iowa Hawkeyes have worked themselves to No. 22 in the current AP Top 25 with a solid 5-0 SU start and they are a profitable 4-1 ATS following last Saturday’s 10-6 victory against Wisconsin as five-point road underdogs. This week, Iowa will play host to Illinois as an 11-point favorite with the total set at 44.5. The Hawkeyes are 4-1 both SU and ATS in their last five home games against the Fighting Illini and the total has stayed UNDER in five of the last six meetings overall. It has been a hot 4-1 start for my weekly top picks for the Big Ten. Last Saturday, I was all over No. 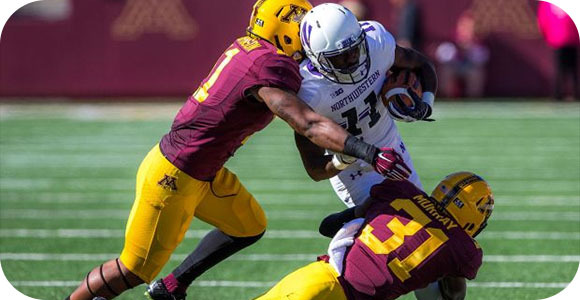 13 Northwestern as a 4.5-point home favorite against Minnesota and the Wildcats came through in a big way with a dominating 27-0 shutout. When you are hot you are hot so I am going to ride the Northwestern again this week as an eight-point road underdog against No. 18 Michigan in the biggest showdown in the Big Ten this week. The Wildcats continue to get it done the old-fashioned way by running the ball and playing defense. They are averaging 248.8 rushing yards a game behind running back Justin Jackson and their defense has allowed a grand total of just 35 points in five games, which is tops in the nation. Michigan is riding a SU four-game winning streak following a loss to Utah on the road in its season opener and it is 3-2 ATS. The Wolverines have shown some solid balance on offense between the run and the pass and they have been just as stout on defense with a points allowed average of 7.6, which is ranked second in the nation. This is bound to be a knock-down, dragged-out affair between two teams that know how to control the line of scrimmage on both sides of the ball. The Wolverines have a 5-1 SU edge in their last six home games against Northwestern, but the Wildcats have covered ATS in five of their last seven road games against Michigan. I see this as a three-point game either way so I will take BetOnline’s eight points with a play on the Wildcats to cover.